Get quality pipe spool drawing services from Advenser. A pipe spool drawing is optimized to provide all the information needed by the fabricator to accurately manufacture or assemble the spool. Spool drawing furnishes the complete information of all parts welded together in the shop on a single drawing. HVAC Engineering essentially means sourcing of quality equipment for Heating, Cooling & Ventilation, fabrication of good quality ducting and accessories suitable for the equipment, matching the two, installing the whole assembly without compromising the integrity of the system. Cad Outsourcing is one of the leading KPO knowledge outsourcing firm in India. We offer cad drafting and designing services from India. Our cad drafting services includes HVAC drafting, HVAC drawing services, HVAC Coordination drawing, HVAC Detailing, Mechanical pipe fabrication drawings, HVAC Duct fabrication Drawing. CAD Outsourcing is one of the leading engineering companies in the World. CAD Outsourcing provides Outsourcing Services for all our HVAC Engineering Services self-discipline in order to expedite our clients to stay focused on their core business objectives. We provide HVAC Services to our Clients. Equipped with a team of experienced engineers and service professionals with in-depth knowledge of our products and applications, Sky Refrigeration Group Private Limited provides a comprehensive solution to your industrial automation needs. In order to meet the entire requirements of customers, we are involved in offering services of HVAC Engineering Service. This HVAC Engineering Service is provided by us to our customers at market leading prices. Further, we ensure to provide these services to customers after taking into consideration the budget of the clients. - Preparation of zoning diagram based on the clients feedback. - Design and preparation of drawings for duct inlet and outlet layout. Being a leader in this industry, we are devoted towards providing HVAC Engineering Services. Under these service, we provide complete HVAC Systems and Mechanical Systems from MEP Designing to HVAC Duct Design that help world wide clients to install High End Mechanical Systems in the Residential towns and Commercial Complexes. Siliconec offers wide range of HVAC Engineering Services by filling gap of designs made by expert engineers that worked on countless projects and serve the clients and customers with their load calculation and HVAC System, Hvac Engineering Services like HVAC load calculation, HVAC system design, High side and low side, HVAC Duct Layouts, HVAC piping design. Silicon Info provides complete solutions for HVAC Duct Shop Drawing Services in all around the world. 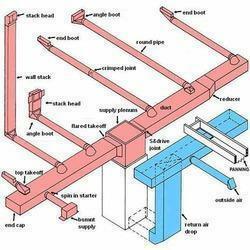 HVAC Duct Shop Drawings are very important tool for better execution of HVAC project from conception to completion. We have staffed with skilled and experienced team of Mechanical Design Engineers, HVAC Engineers and CAD Technicians to cater HVAC Duct Shop Drawings Services. Synectic provides HVAC, engineering, design layout, and drafting services to owners, architects, and contractors for both commercial and residential building applications. We have extensive experience in HVAC design and detailing services. Having the critical support systems like HVAC, water purification system with required standards and their validation complying standards like schedule M , WHO-GMP , MHRA , TGA , USFDA . Separate and hygienically cared in outflow of man and material to prevent cross contamination at any level. Technocool HVAC Engineers, Nagpur, deals in Engineering and contracting field since 2 years. - Hvac Design For Industrial shop floors, small to midsize factories, MCC panel rooms, High Rise buildings, Multiplexes, Hotels, Hospitals, super markets etc. Detailed engineering & design of air conditioning requirement.